Moringa 5000’s Moringa Powder contains 90 nutrients and 46 antioxidant’s and is one of the richest sources of natural iron and calcium. It is considered to be a great natural multivitamin supplement it is also traditionally used. 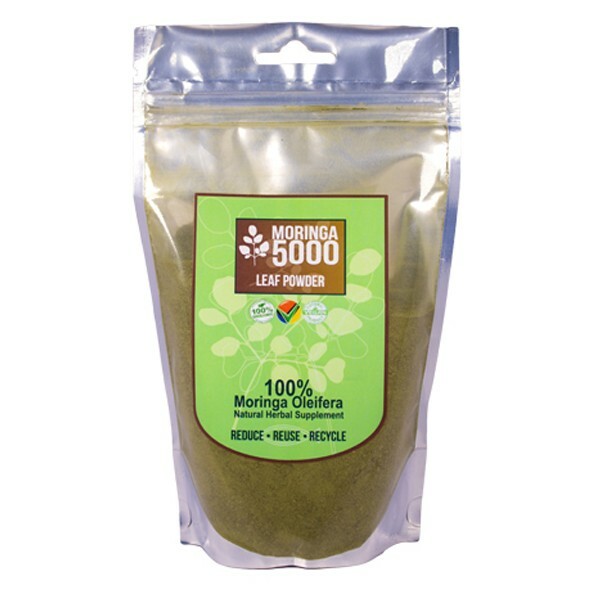 Consuming Moringa 5000 Leaf Powder provides a long-lasting energy boost when used regularly. Our Moringa dry leaf fine powder has a fine grain size and can be added to milk, soup, tea, sauce and other food items. Available in 100 g, 200 g, and 500 g.
Moringa Tea and tea infusions contain 100% Moringa Leaf Powder. Moringa powder is made by grinding the dehydrated Moringa leaves. The leaves are the most nutrient rich part of the whole plant. It contains 90 nutrients and 46 antioxidant’s and is one of the richest sources of natural iron and calcium. Considered to be a natural multivitamin supplement it is also traditionally used. Our Moringa dry leaf fine powder has a fine grain size and can be added to milk, soup, tea, sauce and other food items. The powder is hygienically prepared and packed to the highest standards. Consuming Moringa 5000 Leaf Powder provides a long-lasting energy boost when used regularly. The Moringa tree (Oleifera) originates from the foothills of the Himalayan Mountains in India. The seed was brought to South Africa some 160 years ago by the indentured Indian labourers. Our Moringa products have been independently verified and comply with Proudly South African standards. You can rest assured that our products adhered to the strictest quality controls and contain no fillers just 100% pure Moringa product. Moringa 5000 products are 100% Proudly South African. Unlike other suppliers of Moringa products we source our Moringa locally, which helps create jobs and keeps our communities healthy. 4 times more calcium than milk, 36 times more magnesium than eggs, 3 times more potassium than banana, 25 times more iron than spinach, 2 times more protein than yoghurt, 4 more vitamin A than carrots, 7 times more vitamin C than oranges, 4 more vitamin B than pork. 100% Moringa Oleifera natural herbal supplement. Grown locally with no fillers. 200 gram vacuum sealed packets.